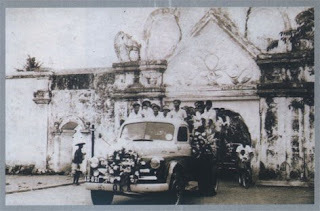 The year 1785, at sat Sri Sultan Hamengkubuwono II is having throne in Kraton ngayogjakarta Hadiningrat, built a wall made from brick along the length of 5 km as defence fortress from Dutch attack. Wall encircling this kraton then usualy is called as fortress, and has 5 fruit of gateway connecting world in kraton ( njeron beteng) with world outside kraton. Because form of curved gateway that is people calls it ' plengkung'. Now, only Plengkung Wijilan and Plengkung Gading which still seen intact. Medium of 3 other plengkung has collapsed. Plengkung Wijilan actually girds name of opening as Plengkung Tarunasura, what has philosophy meaning " Braveman Young Man". While public around mentioning it with Plengkung Wijilan", because this place is entrance dank external e to complex kraton, or Javanese calls it ' wijil'.